Entrants are encouraged to explore the vast wealth of material from five hundred years of song writing, prose and poetry, of writers and composers world-wide who employ the English language. All songs must use the original English. English translations of original foreign words are not acceptable. Ideas can be found in the AESS Century of English Song – Volumes 1-10, details of which can be found on the relevant page on this website. Selected prize winners of all the AESS competitions will be offered the opportunity to perform in the AESS’s Prize Winners Concert on November 3rd 2018 as part of The London Song Festival. The administrator for the Competition is Carolyn Richards, 29 Petersfield, Chelmsford, Essex, CM1 4EP Tel. 07768 086 123. E-mail. CarolynWestrip@aol.com. The preliminary round will take place at St Marylebone Parish Church on Sunday, June 23rd from 2.00pm into the evening. The deadline for entries is Saturday, June 15th. The purpose of the Patricia Routledge National English Song Competition, in accordance with the aims of the AESS, is “to encourage the communication of English words, in singing and in speech, with clarity, understanding and imagination”. Competitors are asked to present and sing a themed recital of ‘Art’ songs with original English texts. The integrated programme may include spoken links and must contain at least one piece of poetry or prose. It should not exceed 20 minutes in total. Candidates are required to bring their own accompanist. The competition is open to full-time students at institutions of further education in the UK and Ireland where singing or speech are taught. Each institution may nominate up to four candidates but may at the discretion of the committee be allowed further candidates if they are of a very high standard. Also, the competition is open to members and to students who are pupils of members of the Association. Open to those who are 23 – 32 years of age on June 26th 2019. 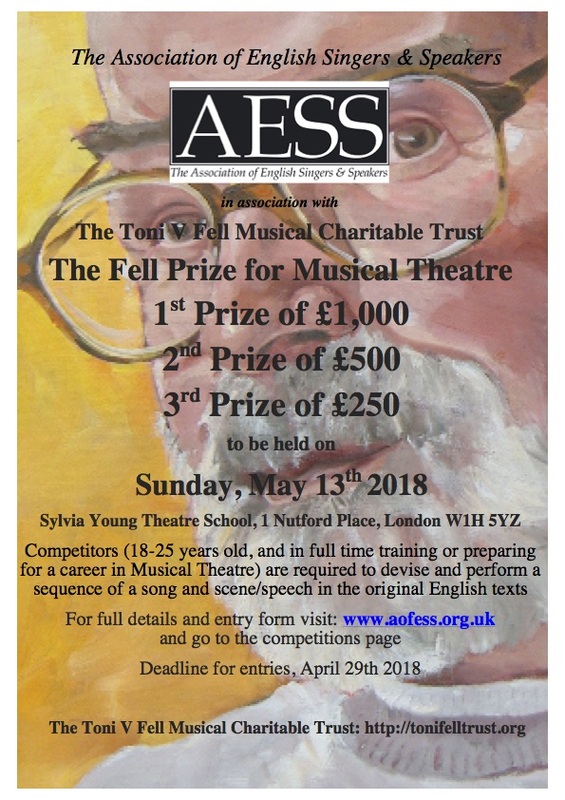 Selected prize winners will be offered the opportunity to perform in the AESS’s Prize Winners Concert as part of The London Song Festival in the autumn of 2019. The preliminary round will be held at St Marylebone Parish Church on Sunday 23rd June. Candidates should state a preference for a particular time, if they have one, (please check this with your accompanist first), although this cannot necessarily be guaranteed. The panel of judges is drawn from members of the Association who have not themselves submitted candidates. They will select up to six competitors from this round to compete in the final. The final will be held at St Marylebone Parish Church on the evening of Wednesday 26th June beginning at 6.00pm. Competitors will be expected to defray their own expenses for the first stage. Standard class travel expenses will be offered to finalists travelling to London. A nominal, non-refundable, entry fee of £20.00 is charged to cover administrative expenses. Entries must be made on the official forms provided and must be received no later than Saturday, 15th June 2019. There will be no competition this year. Do please look again for any possible announcements for 2020. Selected prize winners will be offered the opportunity to perform in the AESS’s Prize Winners Concert in December 2018 as part of The London Song Festival. To learn more about the Toni V Fell Trust visit: www.tonifelltrust.org. The deadline for entries is Monday 15thApril 2019. A nominal, non-refundable, entry fee of £10.00 is charged to cover administrative expenses. Entries must be made on the official forms provided and must be received no later than April 15th 201.